We use a high grade penetrating (impregnating) solvent based sealer to seal your travertine tile surfaces. Their function is to absorb into the pores of the stone and fill them up. Tight pores help keep spills on the surface so they won’t soak in. Although penetrating sealers are not bulletproof, they are essential in keeping some acidic spills on the surface to prevent acids from eating away the underlying layers. This insures the resulting etch, or dull spot, can often be rehoned with the proper abrasives. Common liquids containing acids are: Citrus, vinegar, wine, soda, some perfumes and medicines. While topcoat/surface sealers are appropriate for some types of natural stone, they ARE NOT RECOMMENDED for Travertine, Marble or Limestone. Both photos are of Travertine with a topcoat sealer full of scuffs. Topcoat/surface sealers scratch and scuff much more easily than the stone itself. They will also flake, peel, and if applied too quickly can trap air bubbles and dirt underneath. This leads to a dirty hazy looking floor which most homeowners are unhappy with in a short time. The light patch in the middle is where we’ve removed the coating – the first step in restoring this stone. 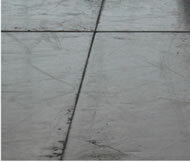 Travertine sealing is a process that we routinely perform. 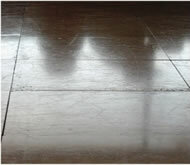 Cleaning travertine is virtually always preceded by travertine sealing. Travertine can be absorbent and is prone to hold dirt, grime and other contaminates in the surface. This is especially true when improper travertine cleaning procedures are practiced. Our Stone Care Guide provides detailed instructions on proper travertine maintenance. Travertine when finished (during fabrication or after market) at a higher honed or polished state will become increasingly resistant to absorption naturally as the surface tension of a highly honed stone or polished stone is greater than that of a tumbled or less honed surface; such as a matte finish. It is imperative to have your travertine sealed when you have any level of travertine restoration or travertine honing performed. One of the biggest mistakes we see with sealing travertine is installers, and others (the list is long) that are simply uneducated in sealing travertine is applying the wrong sealer and applying it to achieve a result that is both improper and often results in resorting to some level of travertine restoration services to remedy the problem. Are you ready to get your travertine cleaned, sealed and looking new again?